Why should you buy Sports Collar Stays? Have you ever noticed how mis-shaped and unseemly your collar looks when you wear a sports shirt? Does it take a lot of time to keep it just right? ; ironing, starching, tried it all and still not happy? Try switching over to sports collar stays or HULAS as we like to call them. They will keep the collar in the right position so that it does not flap over or look worn out. With a smart looking collar, you will look good all day long and this will reflect exceptionally well on your image. How can Sport Collar Stays make you look good? Men usually spend a lot of time, fidgeting with their collar to keep it in the proper position. Now there is an easier way of doing this – Buy sports collar stays. They have to be placed beneath the shirt collar and can be put in place there through their adhesive backed lining. Just remove the adhesive tapes and you can stick them right behind the collar to keep it upright. A single collar stay can be used many times over. You can use it for about five times before the adhesive wears off and you have to replace the stay with a new one. How good you look reflects a lot on your personality. When you present yourself in a sporting competition, gathering or meeting, with a collar that’s looking worn out, dull and which is not looking sharp, a poor image is projected. Do away with such problem with hulas. They can be fitted to any type of sports shirt very easily. Plus you don’t have to spend big bucks on them as they are very low priced. One item will last you for quite a while. Once you start using them, you will find so much convenience, as there is no need to spend time un-curling your collar, say goodbye to dog ears once and for all. The best thing about sports collar stays is that they are available in a variety of colors. 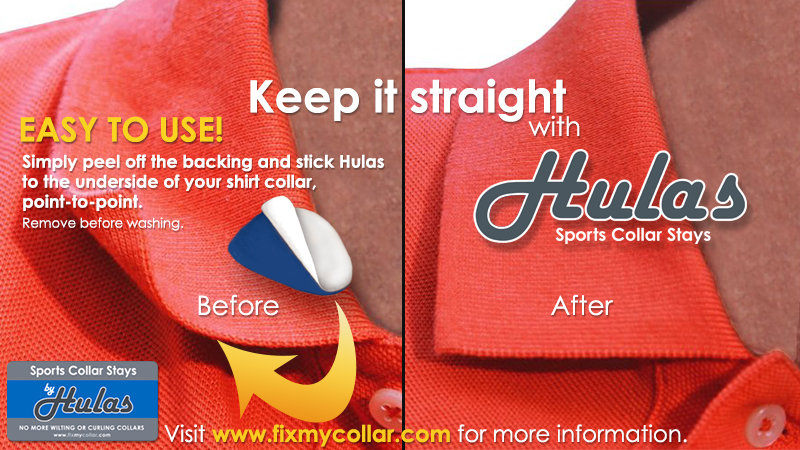 You can find blue hulas sports collar stays, Grey hulas sports collar stays etc., so they can be easily coordinated with the color of your shirt. After you use one, you will be surprised at how good you look. Others who look at you will be really impressed with your appearance. In any social gathering or event, you will look impressive. Using sport collar stays is what best dressed men use. It shows their attention to detail and their need to always look their best. Be a part of this crowd by using collar stays right away. A small effort on your part goes a long way in defining your personality and style.